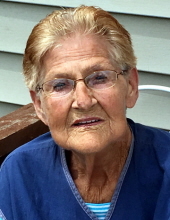 Norma Jean Wheeler, age 79 of Dresden, Tennessee, previously of Clinton, Kentucky, passed away on Wednesday, April 10, 2019 at Baptist Memorial Hospital in Memphis, Tennessee. Norma was of the Baptist faith and attended Siloam Baptist Church in Dresden before her passing. She was known as a feisty, caring and compassionate woman who loved her family dearly. She was also very fond of spending her free time gardening. Norma is survived by two daughters, Deedra Jean Alexander and Dana Carol Perry, both of Dresden; two sons, Darrell Wheeler and Jerry Don Wheeler, both of Dresden; four grandchildren, Jeremy Wheeler, Dustin Wheeler, Matthew Alexander and Ashley Wheeler; five great-grandchildren, Amber Wheeler, Jace Wheeler, Raelyn Wheeler, Rhett Wheeler and Rex Wheeler. She was preceded in death by her husband of 44 years, Jerry Glen Wheeler; her parents, Luther Hunt McWhorter and Gracie Mae McWhorter; one brother, Billy Howard McWhorter. Funeral services will be held at 1:00 p.m. on Saturday, April 13, 2019 at Milner & Orr Funeral Home of Arlington. Burial will follow at Spring Hill Cemetery in Hickman County. Visitation will be from 11:00 a.m. until time of service on Saturday, April 13, 2019 at the funeral home. Contributions may be made in Norma Wheeler’s name to St. Jude Children’s Research Hospital: 262 Danny Thomas Place, Memphis, TN 38105. To send flowers or a remembrance gift to the family of Norma Wheeler, please visit our Tribute Store. "Email Address" would like to share the life celebration of Norma Wheeler. Click on the "link" to go to share a favorite memory or leave a condolence message for the family.